Upper: Air Mesh, TPU welds, synthetic leather. 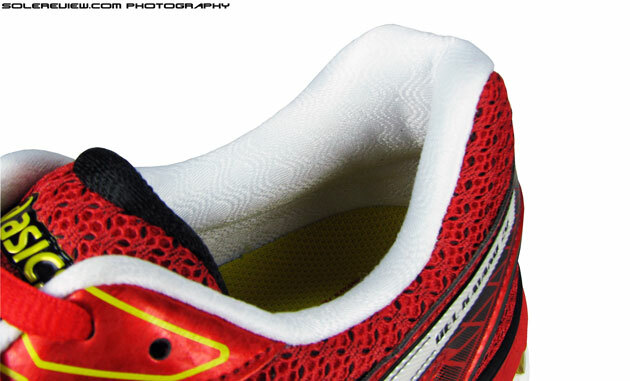 Midsole: Tri-density foam, heel and forefoot Asics Gel pads. The Kayano 20 is a minor evolution from last year's Kayano 19, with a snugger upper, increased heel and forefoot padding. Continues to deliver a cushioned ride, with extensive use of premium materials. However, we do wish the 20th anniversary edition was less bland and had little more character. If you’ve ever been to Japan, or live there, you’ll notice that the good people in land of the rising sun are very averse to sudden, abrupt changes. Everything progresses with gradual flow of time, with instances of overnight transformations being a rare phenomenon. Take the Shinkansen (Bullet train) for example. Launched during 1964 Tokyo Olympics, the name became a standard bearer for high-speed mass transit. A country where punctuality and synchronised clocks are part of the social fabric, JR central (which operates Shinkansen) announced proudly that there was an average delay of 36 seconds in 2012. If this looks good, the average delay in 1997 was 18 seconds. And after ferrying 10 billion passengers in its 50 year old history, there have been zero lives lost to accidents. Today it is not the fastest – a Chinese Maglev ride from downtown Shanghai to the airport runs at an eye-watering top speed of 431 kms/hour, much faster than the average Shinkansen. But what the Japanese bullet-train does is to deliver all around excellence in an everyday, practical package. All of which is made possible by sustained attention to small, yet progressive improvements. The country has been testing its own hyper-speed Maglev since 1972 (yes, that’s no typo), but is no hurry to put it to commercial use. It has been through umpteen iterations and improvements, and will probably start ferrying people beginning 2027. For them, time-tested perfection is everything. Bragging can wait. Japan has exported a lot of that thinking outside their sea-locked borders. ‘Kaizen’ is a management philosophy which has been adopted by countless organisations worldwide, and part of that ethos stresses on the concept of continual improvements spread over a period of time. But hang on a second – what are Bullet-trains and management philosophies doing in a running shoe review? Two decades of Asics Kayano. In 1994, Google did not even exist. Yeah, that long ago. Good question. They’re relevant because Asics is a Japanese brand, and the mindset just described has roots deep within its style of working. Otherwise, why would the 20th anniversary version of the hugely successful Gel Kayano franchise come with only blink-and-miss-it updates? Contrast this to Nike’s approach of re-designing the Nike Air Zoom Pegasus 31 from scratch. Funny we just said that, considering that back in the 60’s Nike’s first shoe was a Asics model with swoosh stitched on the sides. Lots of words and numbers in shape of a 20. Sure, the 20th anniversary Asics Gel Kayano is competent, as it has been for the past many years. It also features commemorative text on the toe tip and foot-bed celebrating its 20 years of existence, but apart from that, there’s little structural change. If you’re looking for a quick summary , here are the headlines: the Gel Kayano 20 feels very much like the 19, except for three things – a softer forefoot, snugger fit and a heel area which is tad more cushioned. The 2014 evolution of the model comes with welded overlays on the upper. Asics calls these welds part of the ‘Fluidfit’ upper. What these welds actually do is to make forefoot and midfoot snugger. The Gel Kayano tries to justify its new ’20’ suffix by including ‘Fluidfit’ on its upper, a structure of welded Kukini-esque overlays. 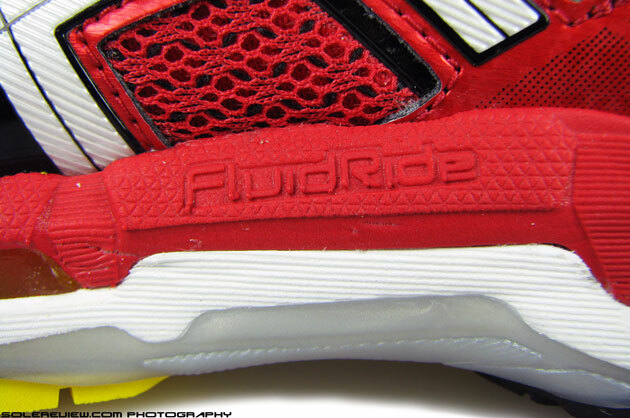 The fused overlays cover most of the lateral (outer) side, extending from the forefoot to rear. On the medial (inner) side, the welds only go over the forefoot area. The effect is predictable; the forefoot feels much snugger than the outgoing Kayano 19, and so does the mid-foot. 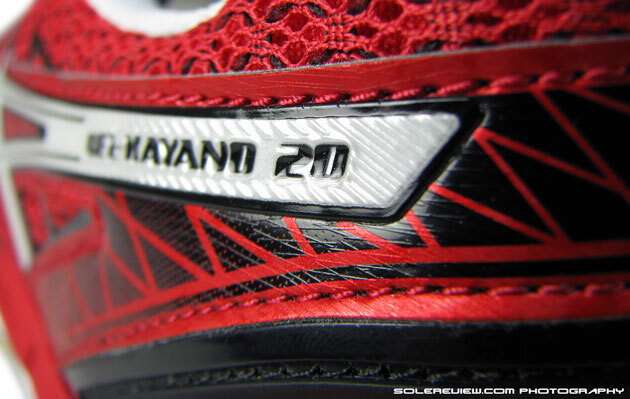 The toe-box height is affected too and there’s less verticle wiggle room in the Kayano 20. Use of spacer (air) mesh on the Kayano 20. Two layers of fabric connected by thin fibers. Breathable, and plush enough. Apart from the snugness, the upper feels more or less the same as the 2013 version. The springy spacer mesh achieves a familiar result when it comes to fit and feel, and the tongue and collar use the same lining material as last year – keeping the plushness levels unchanged. The tongue, though not attached to the upper, does a surprisingly good job at staying put and not sliding even after a 5 mile run. Two factors help this happen. 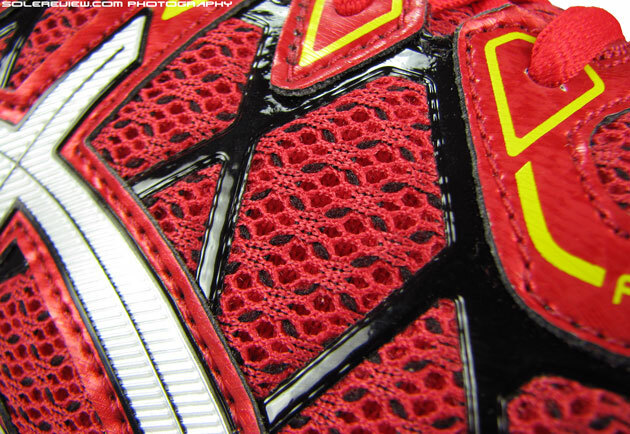 Firstly, the top layer of the tongue is an air mesh (also used in rest of the upper) which doesn’t slip once the laces go over them. Secondly, the tip of the tongue has a soft lining center which curves inwards in a loose ‘U’ trough, and this area does not get in the way of ankle movement. But Asics should not solely rely on this but start including an inner sleeve for a change. Collar lining same as Kayano 19. 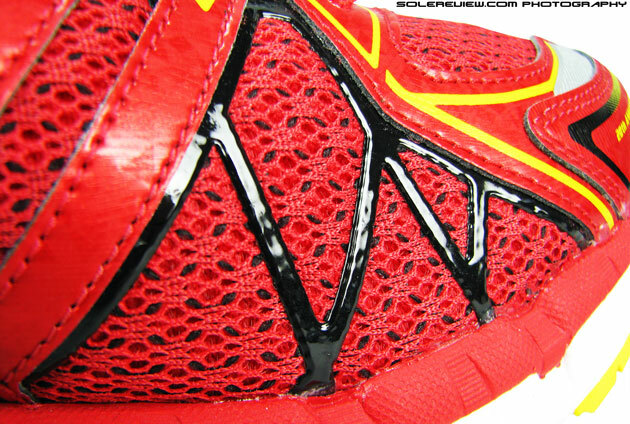 Outer Achilles dip area now uses only type of upper mesh. The collar section uses the same lining but slightly differs in construction. The Achilles dip at top of the outer heel was made of a softer mesh in the Kayano 19, but this year’s model just uses a singular material. This update does not impact the collar fit in any way, and grips well around the ankles without slack. 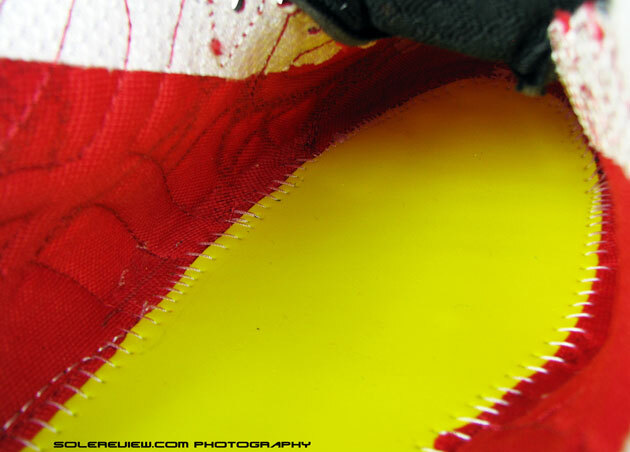 Use of similar, stitched-on overlays and materials leads to very familiar aesthetics, fit and feel. 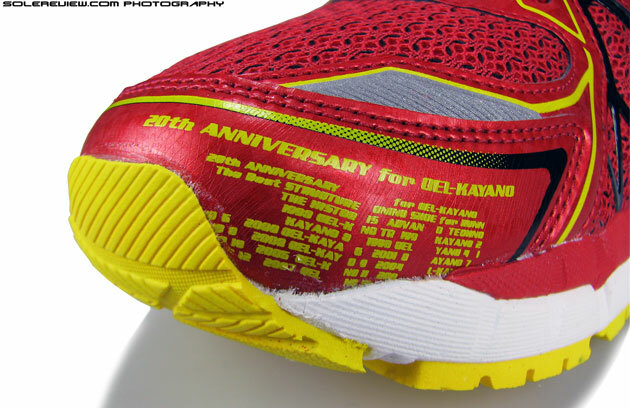 Some more text on toe tip celebrating 20 years of Kayano’s existence. Reflective bit is retained on the toe box. Wrapping all of this up are overlays which are similar in outline to the Kayano 19. Textured synthetic leather panels with some printing and molded details are stitched on the air mesh. The toe box has a reflective strip, little bigger in size than the 2013 version. There used to be this small elastic panel in the Kayano 19 mid-foot, but that’s gone in the Kayano 20 – not that we thought the panel of any practical use. Around the heel is the plastic clip which cups around the rear-foot, with a plastic cage and areas of mesh peeking through. 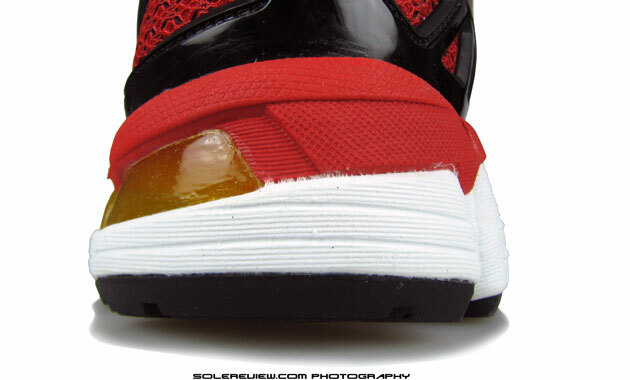 The reflective bit is moved up from the midsole on to the centre of the plastic heel clip. It is still a tiny piece, this, and has cryptic sounding ‘I.G.S’ written over it. What does it stand for? Impact Guidance System. There’s a verbose, jargon-laden description on Asic’s website of what IGS means, but we’re not going to post it here. When dumbed down, it just means that Asics makes use of different elements to result in a smooth heel-to-toe transition. If you’ve been wearing the Kayano of recent years, you would have noticed that the ride has become progressively softer. It is no longer the firm, unyielding running shoe it used to be once. Generous gobs of Asics’ Gel is utilised underfoot alongside a tweaking of the midsole foam density. So much so that when we wore the Kayano 19, we felt it wasn’t far off from the Nimbus 14 when it came to cushioning. The Kayano 20 goes through some minor adjustments in sole construction, but overall ride quality and feel is transferred from the outgoing model. The angle at which two densities of foam are stacked together – now where have we seen that before? Construction is the same as Kayano 19. 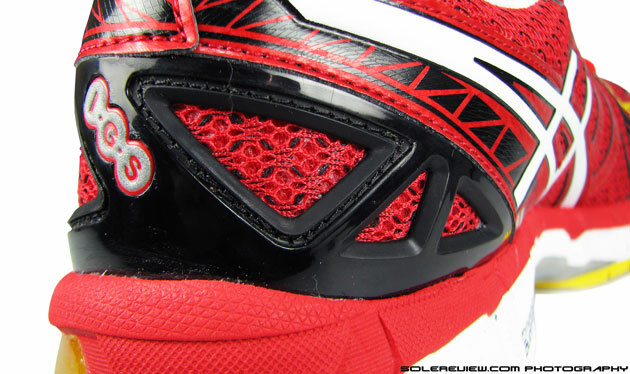 The midsole has two layers of foam delivering three different densities, a softer(white) one topped off with a firmer(red) foam. 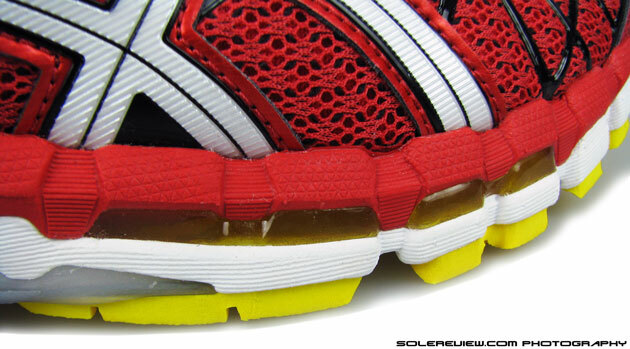 There are cushioned Gel units upfront and rear which appear larger in volume. View at the shoe from rear, and the opposing densities of foam appear to be stacked at a distinct angle. It is difficult to look at that and not think of the Lunarglide 5, which has now established that beveled foam design in mainstream running. The dual density foam (Dynamic Duomax) which used to be this grey, drab looking thing (Kayano 18 and earlier) is longer an eyesore. It is compression molded in the same color along with its softer counterpart and is only identified by grey specks over it. You know the drill about this set-up; softer foam on the outside and harder foam on the arch side. Assuming that you’re a heel or rear-foot striker, the soft and hard foam combination prevents excessive rolling-in of low-arched or flat foot. That’s the generalization which accompanies all stability or motion control shoes. A ridge running the midsole length helps keep weight centered, so transition is good. Go for a run in the Kayano 20, and the heel feels more cushioned underneath. 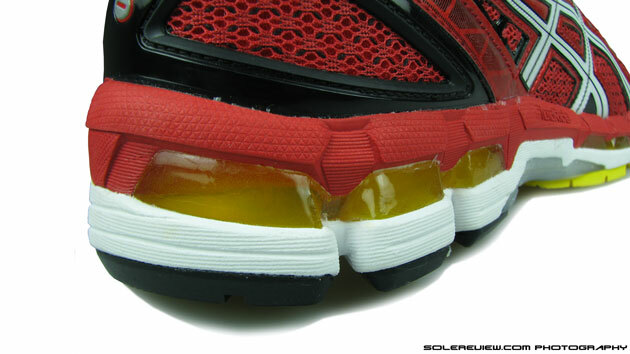 The firmer layer on top is thicker, but then there’s increased Gel coverage right under the heel area – resulting in a higher level of compression. Foot strike transition is good, as it usually is in most Asics shoes. The heel-to-toe groove, which Asics calls the ‘Guidance line’ helps keep the weight centred through the gait cycle. The under heel crash pad is also decoupled (separated by a deep flex groove) so heel strikers will find landings gradual and smooth. The Kayano 20 forefoot is better padded than the 19. Why? The half-fabric strobel is swapped with a full foam one. The Kayano 20 forefoot goes plusher, and that’s because of one simple reason. You see, in Kayano 19, the strobel (below the removable footbed) was half-foam and half-fabric. This year, the entire Stobel is a layer of soft foam, including the forefoot. (see picture above). This makes the front underfoot area softer than the outgoing version. And what Asics gives in cushioning, it takes away in flexibility. Owing to material change and revised placement of forefoot Gel pads, the Kayano 20 bends less easily in the forefoot than 19. Outsole is ‘redesigned’, meaning that the basic geometry looks the same but they’ve actually swapped molds out for the entire outsole+midsole+shank. The changes come through in the form of lugs are designed and textured; along with mid-foot shank undergoing a small tweak. That said, we’re curious to see how Asics approaches the evolution of their outsoles. Will they start filling out the mid-foot shank area as Nike and Brooks have done recently? The rest of the formula is tried and tested. 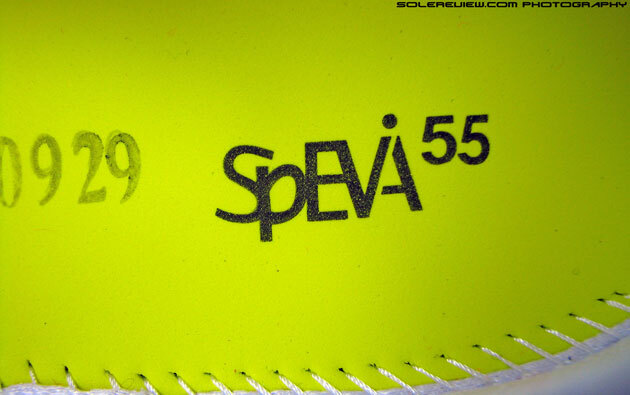 The forefoot features blown rubber, which combine grip and padding. Rear-foot sees the use of hardened Carbon rubber which sits somewhere in the durability median. There’s not much to report apart from these changes. 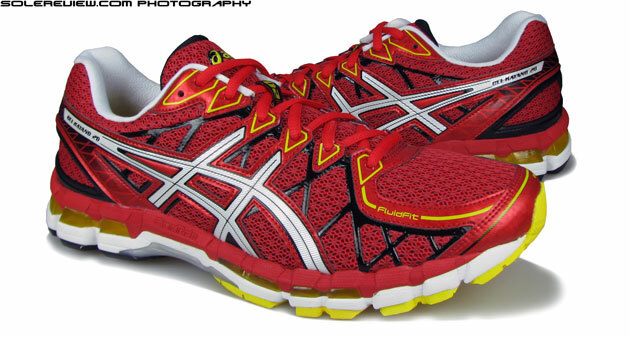 The 20th evolution comes with very subtle updates, and in general fit and feel is very close to that of Kayano 19. 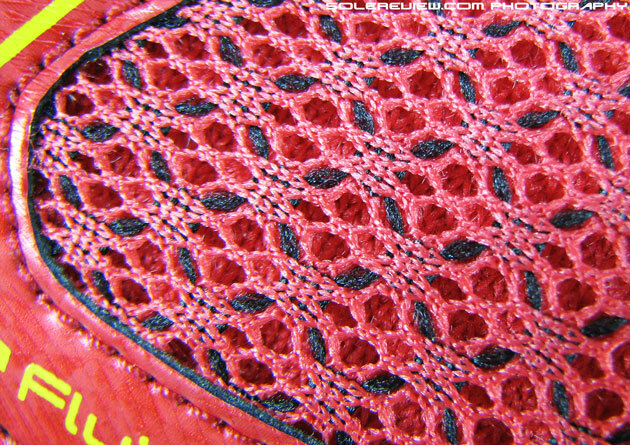 Upper patterns and midsole/outsole are brand new, except that fails to feel so. For a shoe which is this close to its predecessor, it might just make sense to carry over the midsole/outsole molds and not change it. After all, making running shoe molds is a pricey affair, and undoubtedly costs are passed down to the person who is buying the finished product. Kayano 20’s $10 increase in retail price is proof of that. The other point worth pondering is that for how long will Asics continue to use traditional shoe construction methods in its signature models. Agreed, things like stitched-on overlays, compression molded midsole make the shoe look expensive, worthy of its $160 price tag. They’re also ingredients for premium aesthetics and experience. The downside is that everyone else is moving in the opposite direction. Even brands like Brooks have ditched some of their legacy cushioning and construction set-ups and moved on to 3D printed overlays and foam based cushioning. These shifts result in lighter shoes, and while runners might not mind the weight difference between Asics and rest of the brands today, but at some point in the future it will start getting felt. The slow-increments-inching-towards-excellence approach works well for high tech marvels like Bullet-trains and management philosophies because their end-use warrants so. But that mindset should not apply for seasonal consumer goods – these are fast changing times, and maintaining status quo doesn’t help. Look at Japanese electronic companies; once doyen of the industry, they have been upset by much younger upstarts working on a maniacal innovation calendar. So it is important for Asics to aggressively innovate. And by that we don’t mean its ’33 series’, which was simply a competitive response to the low heel-drop boom. Today the 33 line looks sketchy – the Gel Super J33 upper is an undisguised Kinvara 3 knock-off, and rest of them seem vague in purpose. We’re sure much consternation ensued at the Japanese HQ when they were asked by their American colleagues to bring out lightweight running shoes. The results were predictably pitiful, which shows that innovative thinking should be part of daily work culture and not a forced external influence. And truth be told, as shoe reviewers nothing fires us up more than a just-off-the-assembly line innovation in foam, mesh and rubber. Appreciate your observations about Asics’ recent trend toward softer midsoles. I’m one of those older, heavier joggers who prefers a bit firmer cushioning. I’ve actually switched over to their less expensive Gel-Excite 2, which is simple IMEVA. Half the cost, and I like the feel better. The Excite and Equation are pretty good shoes for what they are. Thank you for sharing your experience, and the switch makes perfect sense given your needs. Most of the so called >$100 ‘stability’ shoes have nothing stable about them. Stable by definition is the opposite of soft – which most of the shoes like the Kayano are evolving into! Throw the Nike Structure into that list too. Thanks, please let us know if you get a chance to wear these – look forward to your opinion of the Pursue. We just wish Asics starts differentiating its designs. Right now it is a sea of sameness for the Japanese brand, with outsole/upper aesthetics and construction looking more or less the same for most of their shoes. Our advice would be not to continue wearing a shoe which causes injuries, as there’s a risk of increasing it. If the LG4 worked so well for you, do try the Lunarglide 5, it should still be available online. 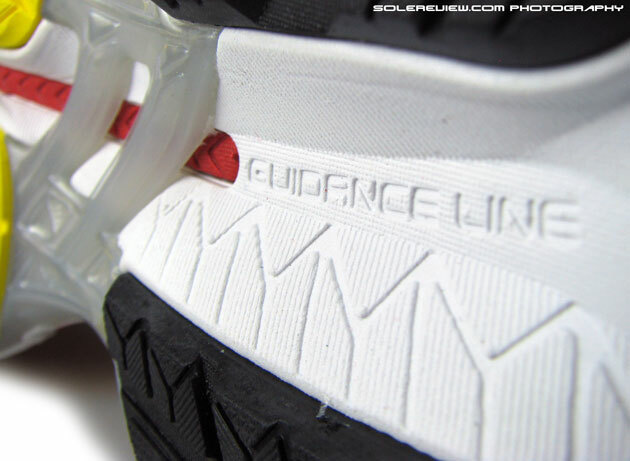 The Lunarglide 5 has the same sole unit as the Lunarglide 4. Hope this helps, and good luck with your training! Unfortunately, there is nothing at the moment which 100% mimics the ride behavior of the LE2. There is some hope in the upcoming Lunareclipse 5, but that’s a few months away. How does the Kayano 21 fare against the 20? Too close to call? Softer. Much softer. The Kayano 21, that is. I can get the Kayano 20 a good bit cheaper than the 21 (about €40), is the 21 worth the extra cost? Not worth the cost, unless you really value an increase in softer cushioning – which the Kayano 21 delivers. Had a pair of these, the toe box wore almost all the way through after just 140+/- miles. Have heard this may be an issue? Sent them to Asics and just received a replacement pair of 21’s. Hoping that they last a bit better. The cushioning is definitely greater in the 21’s. Haven’t heard this from anyone else, but glad to hear that you got an upwards swap to 21’s. I want to purchase a shoe for my wife. She has normal arch and a slightly wider forefoot. She weighs about 68 Kgs. She will use it on treadmill for walking. I am confused amongst Asics Gel Kayano 20, Nike Pegasus 31 and Nike Lunarglide 6. Please advise. Please suggest some other alternative also. I am based in India. Thanks in advance. She could try Pegasus 31 and also the Skechers GoRun Ride 3. But as foot shapes vary, she needs to make sure those shoe fit well before buying. Would I be correct in assuming the Kayano 20 from a cushioning perspective sits somewhere between the GT2000-2 and Nimbus 17? I bought the Nimbus on release day but as my fitness level increases and I become a better runner, I am finding it very, very sluggish and heavy…a friend is sending me the Kayano 20’s so I’m excited to try them. More like between the GT 2000-2 and Nimbus 16… since the 17 is at the extreme end of the soft spectrum.